The crawl space is the underbelly of your home, and its health will determine the health of the floors above. Much can go wrong within a crawl space: pest infestation, flooding, water damage, mold and rotting beams just to name a few. Bloom Crawl Space Services insures that your home is safe from the extremities of the world. 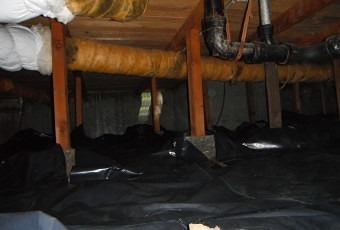 We specialize in making the crawl space of your home as protected and healthy as it can be. Our experience and attention to hard work, detail, and determination is the key to our success and your happiness. Do you live in an area where water is a constant problem and your crawl space is always be filled with water? A French drain might be the solution to your problem. A French drain collects all of the water in your crawl space at a low point, where it can then be moved outside with the use of a sump pump. This will quickly ease your trouble with flooding, and protect your home’s infrastructure from further harm. Please feel free to click on the link above to learn more about French drains and how they can help you. Crawl space waterproofing is the only way to completely prevent your crawl space from water and moisture. Your crawl space will be coated in a heavy plastic mask that will block all water from coming in. 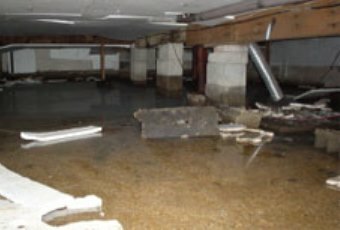 Don’t make the mistake of waiting until you already have a water problem, call today and get your crawl space protected. One of the easiest ways to damage the infrastructure of your home is to leave the foundation unprotected to the elements. Moisture and cold can easily rot away the wooden beams inside your crawlspace. Installing a vapor barrier is the best way to prevent this. Excess moisture can lead to mold, and mold can lead to poor air quality in your home. A vapor barrier protects your home by blocking moisture from entering the crawl space. The barrier stops the cold air flow from the ground, resulting in your floors being warmer in the winter time, and a lower energy bill. Blooms excellent crawl space services can help. The crawl space is dark and warm, a paradise for pests and animals. Right under your feet could be an infestation and you wouldn’t even be aware. Our pest control experts use only environmental friendly products to oust pests. You can feel safe knowing that there aren’t any harmful chemicals stewing underneath your home. Feel free to click the link above ‘Crawl Space Pest Extermination’ to learn more about how easily this can be set up and helpful it will be. 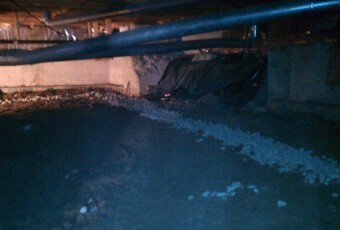 Does your crawl space have gaps in its structure? Are pests able to get into your crawl space through these gaps? Then crawl space entry exclusion is right for you. Animals and pests can easily climb or crawl through the smallest of gaps in your home’s infrastructure. Our service will cover these gaps and seal them, blocking and preventing any further entry from unwanted pests. Click ‘Crawl Space Entry Exclusion’ for more info.